This one presented a bit of a problem for me. I don't have a die that will cut a half circle. So I had to trace a ribbon spool and then cut my half circle. But I am very pleased with the way it turned out. I love the dsp and the color combo is very Christmas-y. 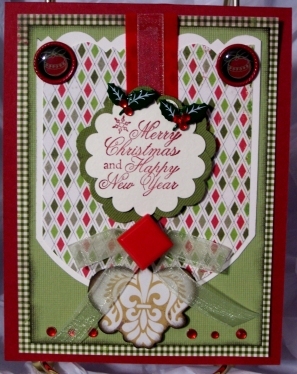 This card was entered into the CASE Study Challenge #68. Now that's using your initiative! The ribbon spool idea worked a treat on this fab Christmas card! What a fantastic holiday card! And what a creative way to get the half-circle! Thanks for playing along with this week's CASE Study challenge! This is such a great holiday card! So warm and inviting! Thanks for playing along with us at CASE Study! I love how you made the shapes for the card! LOVE the traditional Christmas colours :) Thanks for being the first out of the gate at CASE Study this week! Woohoo!! Such a pretty card, I was considering doing a sketch take on the inspiration but ended up with something totally different! Glad you used a ribbon roll to trace; I've used Mason Jars, butter tubs, peanut butter lids...! Great card!